What is the most effective of propeller's rotation in a two-propeller engine airplane? 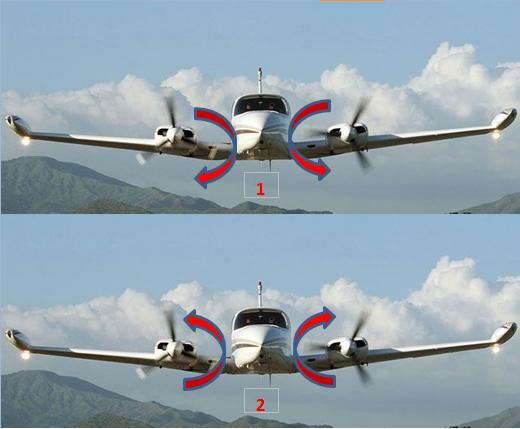 Consider two-propeller airplane as picture below (picture 1 (the above) and picture 2 (the below)). Which one is the most effective configuration to produce thrust power, stability, structural design, etc if still any? Picture 1 (above): the bigger angle of attack (due to parallel to the gravitation) is meet near the fuselage, in between the two propeller's axis. Picture 2 (below): the bigger angle of attack is outside the two propeller's axis. Need physic analysis to answer this question. It all comes down to P-factor. Airplanes fly at a positive angle of attack, so as you can see, this AoA for the wing translates to positive AoA for the descending blade. 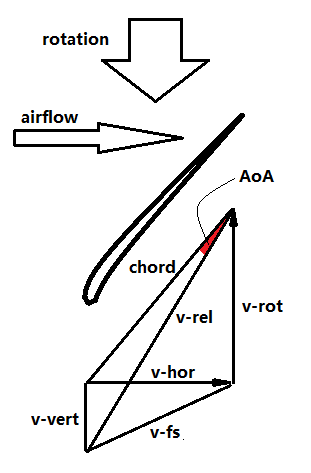 Vice versa, the positive AoA for the wing is negative AoA for the ascending blade. I.e., the descending blade has more thrust than the ascending blade under AoA. Now it is pretty obvious why you want the descending blade on the inboard and ascending blade on the outboard, because in a single-engine-out incident this creates a less yawing moment to the otherwise arrangement. However, life does not always turn out as we want it, as the engineers at Lockheed learned the hard way when testing their XP-38. They had gone through the trouble of using handed engines and props, making the starboard engine turn counterclockwise and the port engine clockwise. Now the fighter appears to be perfect: no torque, no gyro, a minimum yawing moment in a single-engine-out situation. But the XP-38 had pitch control issues which were later found out to be caused by the downwash created by descending inboard blades hitting the wing section between the boom and the central nacelle, creating a disturbed airflow trapped between the twin booms and finally affecting the elevator. In the end, they had to switch the engines' positions so the P-38 ended up with two critical engines. Not the answer you're looking for? Browse other questions tagged aircraft-design aircraft-performance aircraft-physics or ask your own question. How to start deriving longitudinal equations of motion for an aircraft? Which one is more effective produce power of this two turbine's location?